Formed in 2002 by four men and two women, former members of the Univ. of Northern Colorado's Grammy-nominated ensemble, Vocal Jazz 1, Groove Society has a growing reputation for thoughtfully crafted arrangements, intricate rhythms and exhilarating improvisations. Although their roots are firmly planted in the Jazz genre, they perform in a variety of styles, Latin, blues, bebop, rock, pop funk and R&B with their trademark exuberant passion and soul. 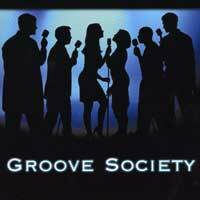 "Groove Society," their impressive debut CD, features 11 tunes, and it's hard to pick favorites. That said, we really liked Tito Puente's "Oye Como Va," the Gershwins' classic "Summertime," and a "Tribute to Earth, Wind and Fire" medley that few groups would attempt, much less nail as Groove Society has here. Van Morrison's moody "Moondance," the Harry James/Duke Ellington hit "I'm Beginning to See the Light," Chicago's "Does Anybody Really Know What Time It Is?" the Doobie Bros.' "Listen to the Music" and the final cut, Barry Manilow's rainy-day "When October Goes" are particularly well done. For such a young group, GS has the poise, the bright, polished sound, the effortless vocal percussion and the cutting-edge arrangements of a veteran group with years of experience singing together. Groove Society is going places fast!